Leave our Central Paris agency at 6:15 p.m. for a unique evening in the heart of Paris. This night-time adventure includes a once-in-a-lifetime dinner on the first floor of the city's most famous monument and a magical cruise along the Seine. 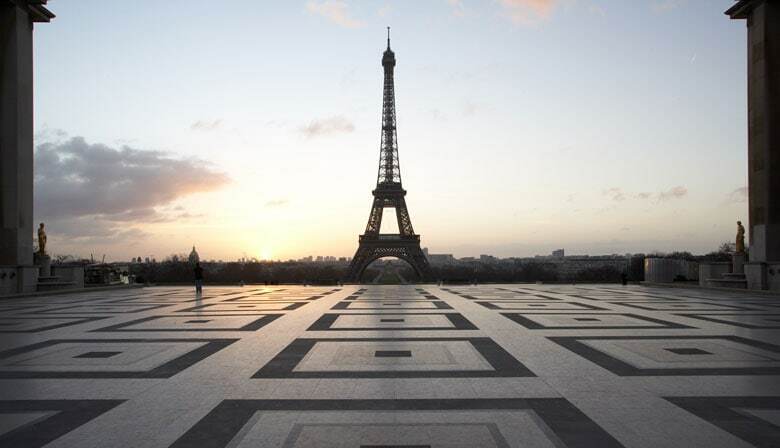 Your priority ticket will allow you to skip the line and directly access the first floor of the Eiffel Tower. Thanks to its uninterrupted, breathtaking views over Paris, you will be able to spot Montmartre and the Sacré Coeur, the Invalides, the Champ-de-Mars, the Champs Elysées and the Arc de Triomphe. The restaurant offers an ideal setting to spend a wonderful evening. The modern decoration and the walls made entirely of windows allow you to appreciate the view. You will enjoy a generous meal to discover the traditional French food. At the foot of the Eiffel Tower, after dinner step aboard a glass boat for a wonderful hour-long night Seine river cruise. See these illuminated monuments from the water: Notre Dame de Paris Cathedral, the Conciergerie, the Louvre Museum and the Orsay Museum. Multilingual audio guides (French, English, German, Spanish, Italian, American, Portuguese, Russian, Dutch, Polish, Chinese, Japanese and Korean) will tell you about the history of the City of Light and life in Paris. Spend a fairy-tale evening! If you want to take your time at the Eiffel Tower after dinner, you can reach the 2nd floor with no extra fee taking only the stairs. You can do the cruise later on your own (Port de la Bourbonnais, Bateaux Parisians company, in front of the Eiffel Tower. Departure every hour until 9.30pm). It is recommended to inform the hostess about it. The food left much to be desired. Guests buying this excursion should know that you do not get a choice as to what you eat at the restaurant in the Eiffel Tower. Transportation was good, we were in what seemed to be a luxury bus. Priority access into the tower was great, as there was a long line to get into the tower. Obviously, views from the tower were amazing (with free access to the 2nd floor by stairs) and the river cruise was great as well. the guide/tour leader who is bringing us to eiffel tower and dinner wasnt that friendly. anyway we have a good time because of the place and the climate was excellent on early october. cruise was ok but we were tired to enjoy the cruise after eiffel dinner. its a life time experience so for the first time visitors i will strongly recommend them not to miss this although it is expensive. Dinner st 58 and the Seine River cruise were very enjoyable.